In this Instruction Series Overview, entertainer Nancy Hays and award winning instructor Greg Gale teach introductory steps to six standard ballroom dances. Once you have learned these steps, you will gain the confidence you need to dance at your wedding or in any social situation. You'll also learn the answers to many questions often asked by beginners and how to help identify what dance is appropriate for the music you enjoy. You'll discover why new generation ballroom dancing is easy, fun and romantic! 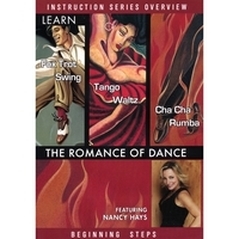 This DVD serves as an introduction to the Romance of Dance series. Volumes 1, 2 and 3 offer in-depth instruction on basic steps and live music for practice purposes. Popular dance instructors Evin Jacobson and Noel Galang join entertainer Nancy Hays to teach you the basics of the most popular swing steps including Easy Six-Count Swing, Charleston, and the Lindy Hop Basic, as seen in recent films and television advertisements. You'll see some of America's finest lindy hoppers dressed in swing fashions jumpin' and jivin' to the sounds of Nancy Hays and Righteous Swing--a 10-piece jump-blues and swing band! There's also live concert footage of the Cherry Poppin' Daddies performing their international hit "Zoot Suit Riot" and information about the world of swing that goes beyond the steps--from dance history and current fashion to Internet sites and the hottest bands and clubs. This tape is sure to put you in the mood to get "togged to the bricks" with the other hep cats and swing out! Yes, it is possible! Let Nancy Hays, singer, dancer, performer extraordinaire, introduce you and your lover to The Romance of Dance! 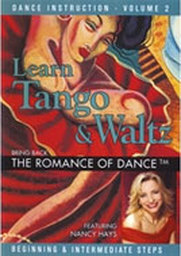 Bring Back the Romance of Dance: Tango & Waltz Beginning Steps is an entertaining, easy and romantic video for the new generation of ballroom dancers. Entertainer Nancy Hays and award-winning instructor Greg Gale demonstrate the beginning steps to the Tango and Waltz. You've seen these smooth dances featured in many recent movies, commercials and theatrical productions. They are particularly popular for weddings and special occasions (like Valentine's Day!) because of their flair, passion and elegance. In Bring Back the Romance of Dance: Tango & Waltz you'll be dancing along with others to the music of Nancy Hays and The Bobby Benson Orchestra, who will set the mood as they perform standards from songwriters such as the Gershwins, Cole Porter, and Irving Berlin in a contemporary style, at the famous Ambassador West Hotel in Chicago. 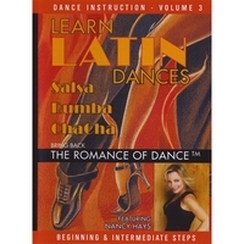 Entertainer Nancy Hays and award-winning instructor Greg Gale join forces again to teach you the basics of the most popular Latin steps including Rumba, ChaCha, and Salsa. These dances are great for the Latin music of yesterday as well as the hot new songs by today's biggest Latin artists. Learn these sensuous dances in the privacy of your own home - on your own time. In just a few hours you'll see how easy it is to gain the confidence in any nightclub, ballroom or social situation. ​Practice music includes Latin standards and the Salsa music of Samuel Del Rreal and his Orchestra. Join the fun and see wy new generation Latin dancing is Hot! Hot! Hot!